We all know Ferrari – world famous car manufacturer producing most exclusive supersports. Many unique cars were and probably will be produced under this brand – Maranello, Enzo, Spider etc. Now, we’re going to talk about Ferrari 430 Spider. Same exclusive company Hamann made bodykit for this car. We like original bodykit, but ‘some like it hot’. That doesn’t mean this spider isn’t hot enough. Only one stallion is in the sign, but there are 538 hidden in the V8 engine with 4,3 litre volume. It’s situated in back of chassis, what is usual Ferrari style and provides best allocation of weight between both axles. While front is under weight of wind, making pressure on the front axle, rear axle is pressured under the weight of engine. 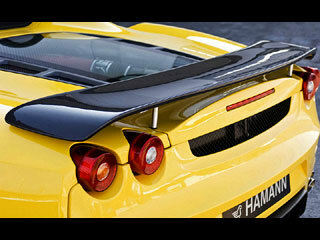 In this case, Hamann added spoiler which made F430 more stabile, mostly in fast drives through difficult curves. Upper part of engine is visible through clear glass, so it’s plus for those who like a bit of extravagance. Four rear lights are traditional, without them Ferrari wouldn’t be Ferarri. What to improve on this unique car? Also Hamann designers were facing this question. They improved spider’s bodykit with lightweight carbone air dams also with diffusers correcting flowing of air what is very officous for stability at speeds about 310 kmph, which is maximum speed. We can notice them under the front bumper and also in the place of rear diffusor. Another unique part is spoiler (rear hood) also made from carbone, set-up on four extravagant oval legs. Although they’re only details, they make F430 more special. Yellow colored chassis improved with black parts (wheel alloys, bumper parts, diffusors, grids) gives sport feeling to this coupe. Quartet of rear exhausts provides bass sound (which is usual in this category) and also elegant and retiting look. Second advantage of rear spoiler is the improvement of aerodynamic quality of car which isn’t very well in original Ferrari Spider production. This improvment is quite notable. Let's tell us your opinion - do you like this supersport tuning?